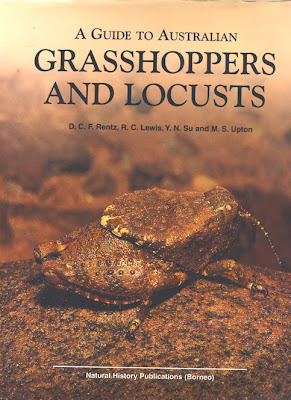 The Northern Grass Pyrgomorph occcurs across the top of Australia and down the east coast nearly to the Victorian border. It overlaps much of its souther range with the Australian Grass Pyrgomorph, A. australis Rehn. The two are very difficult to distinguish and you need to make measurements of the proportions of the length and width of the fastigium (the process between the eyes and base of the antennae) to make an identification. 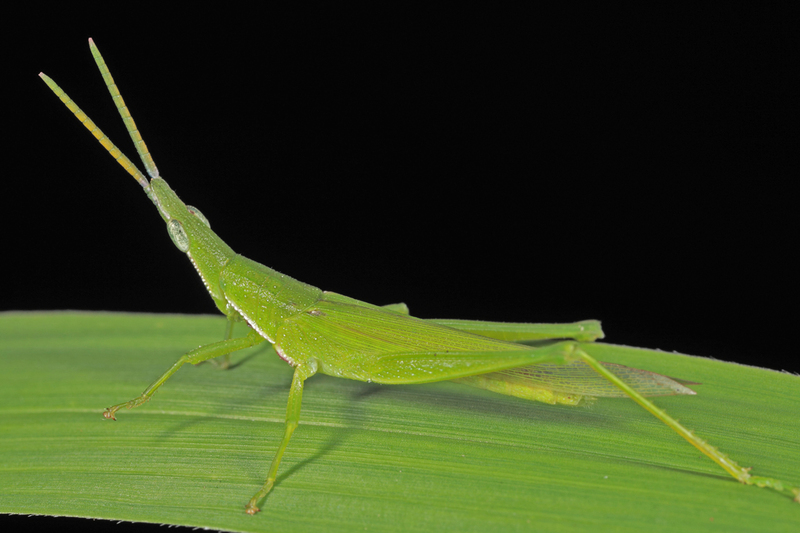 Atractomorpha is a large genus with many species in Asia and Africa. There is a third species in Australia known from sandy areas and the escarpment in the Kakadu region of the Northern Territory where is is associated with the shrub, Hypoestes floribunda. 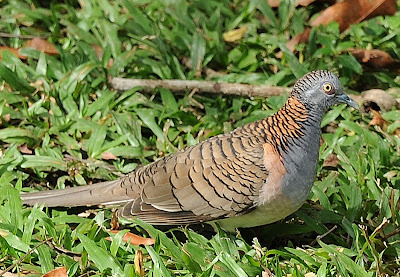 It has a red-orange hind wing as opposed to the rosy pink hind wing of the other two species. The Northern Grass Pyrgomorph occurs along rainforest margins but it is equally at home on lawns and playing fields. It is remarkablde that it survives and thrives on lawns that are regularly mowed. It either jumps or flies away from the mower to live feeding on grasses and forbs until the next mowing session. 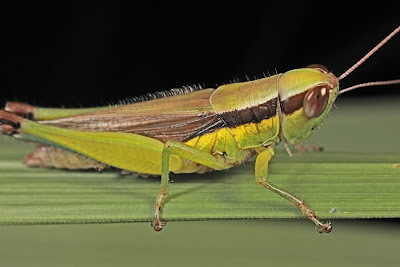 Froggatt's Buzzer, Froggattina australis (males 19 mm, females 28 mm), is another grasshopper commonly seen along forest margins, on lawns and playing fields. Unlike the Northern Grass Pyrgomorph, males buzz when they fly. They make very short flights on under 2 m suddenly drop and seem to disappear into the grass. 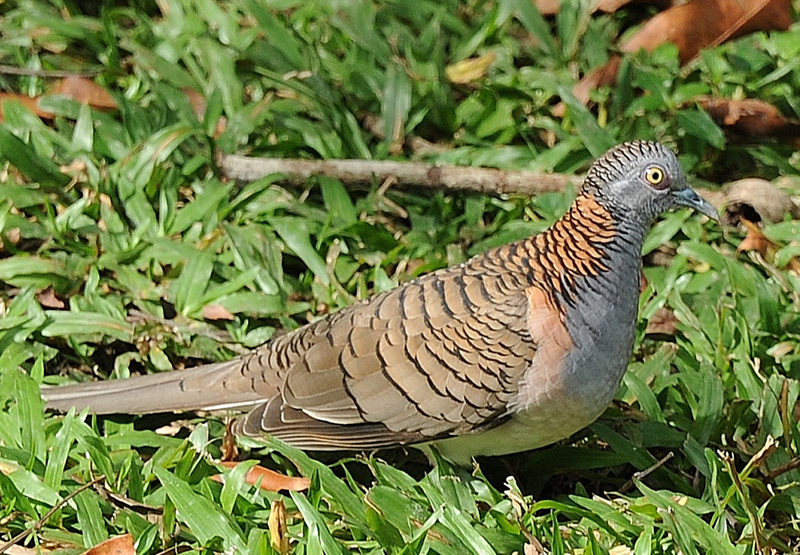 The colour and colour pattern is variable in this species. 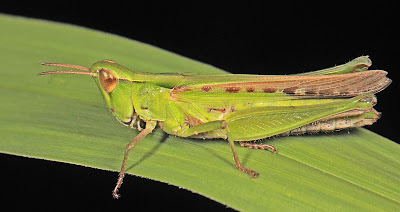 If the grass is primarily green, then green is the predominant colour of the grasshopper. 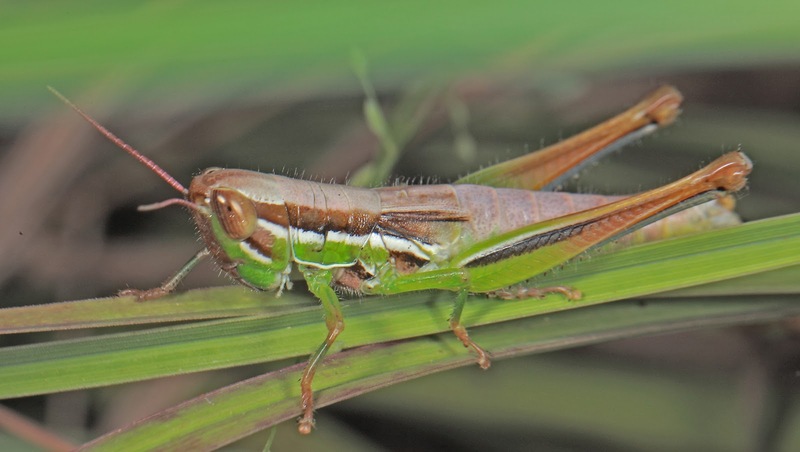 If the grass has a lot of dead brown patches and is predominantly brown, then the grasshoppers will be more brown than green. Froggatt's Buzzer occurs on both coasts of Australia and in a broad band from NW Australia through the centre and almost to the southern border. A similar but smaller species, Calephorops viridis, overlaps with it in coastal areas of northern Queensland and NW Western Australia and adjacent Northern Territory. It is a much smaller and more slender species (males 15 mm, females 20 mm) and similarly buzzes but the buzzing flights are much shorter, lasting less than a half second. The Garden Bermius is known to many gardeners along the east coast of Australia, especially in Queensland, New South Wales and Victoria where is has the habit of invading vegetable plots and feeds on lettuce, beans and other vegies. It is a species of disturbed habitats-a weed species. It is a native that finds human activities to its liking. It does not live on lawns but can be found in adjacent vegetation, especially if there is abundant moisture. The"prosternal tubercle", the peg between the fist pair of legs is a useful character to help identify many grasshoppers. The "Buzzers" discussed above have no such process between their front legs. In the example of the Garden Bermius, this structure is called a "peg". 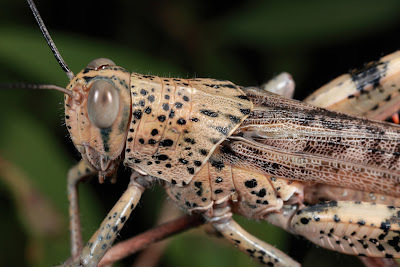 This grasshopper can be confused with the one below, the Rice Grasshopper. They are of similar size, though the Garden Bermius is a bit larger (males 23 mm, females 33 mm) and does have banded antennae and does not have the hind tibiae expanded for swimming. The Rice Grasshopper has a very broad range in Asia where it does considerable damage to rice and other grasses. In Australia is is found in a narrow band along the east coast from the vicinity of Cairns south to almost the southern border of Queensland. 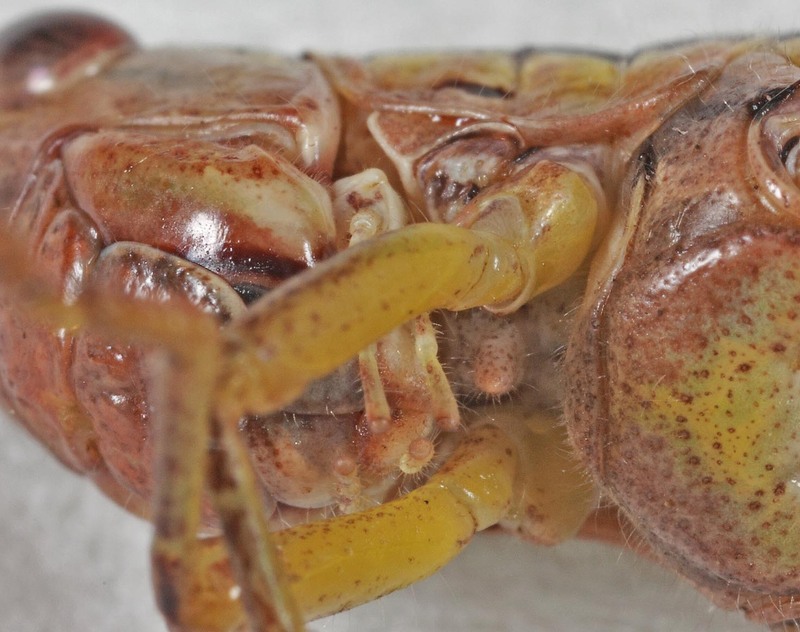 It has been found in the northern portion of the Northern Territory. Oddly, it is not a pest in Australia. 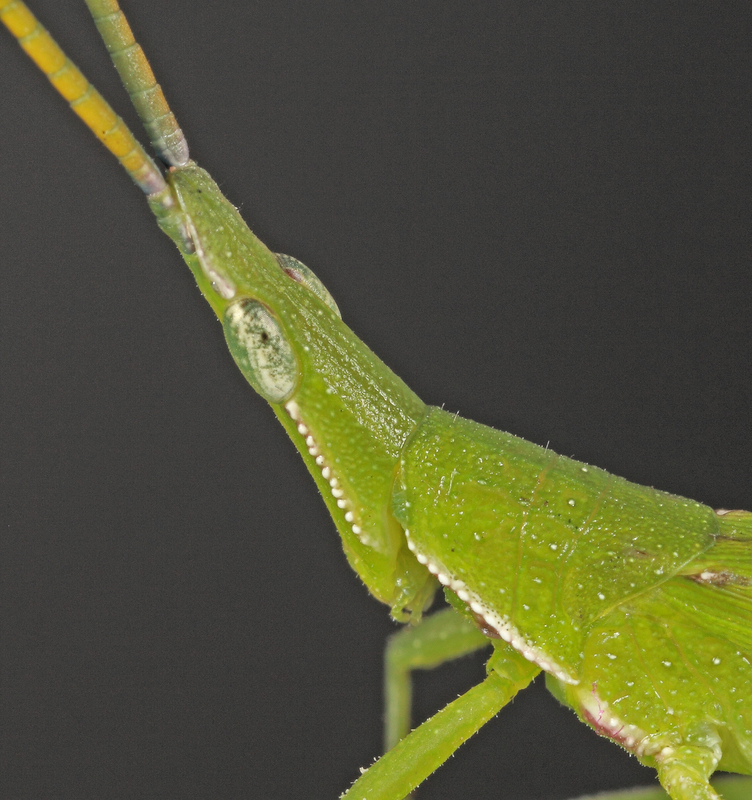 The antennae of this species are not banded. The apical portion of the hind tibiae are expanded, somewhat paddle-like. This helps the grasshopper to swim which it does readily when threatened. 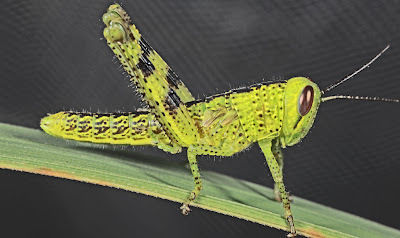 The Fireman Grasshopper is so-called because of its escape habit of sliding down grass stems as a fireman slides down the pole in the firehouse. This grasshopper is short-winged ( click on the hopper above to expand the photo), the wings extending a short distance down the abdomen and incapable of flight. 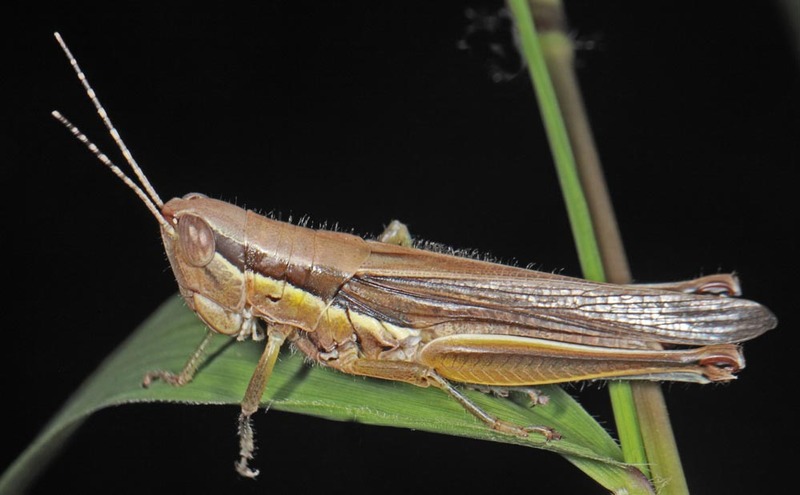 This is a common species and lives in grasses and forbs in disturbed areas, especially along forest margins. It has a reasonably large range extending along the coast from southern Queensland across the top portion of the continent and into the Northern Territory and adjacent Western Australia. The Giant Valanga is known to most gardeners from northern New South Wales to north Queensland and the northern part of Western Australia and adjacent Northern Territory. 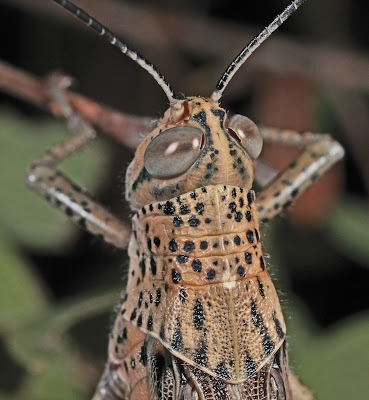 This is a large grasshopper (males 64 mm, females 87 mm) that is capable of making extensive flights. Deposition of a single egg pod amongst shrubs in the garden can lead to a disaster. The nymphs are voracious and feed on a wide variety of ornamental and native shrubbery. They can reduce an expensive plant to shreds in a few days if not controlled. 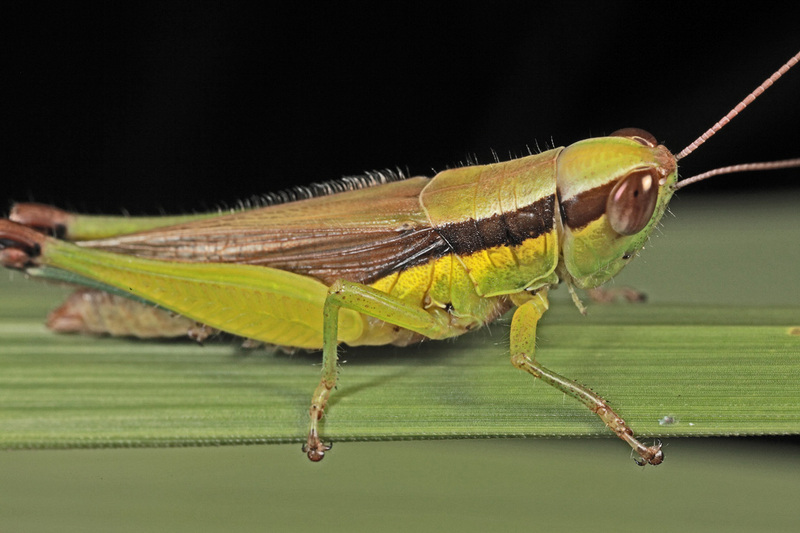 Valanga poses a difficult taxonomic problem in Australia. Either there are many similar but slightly different species or, as is now accepted, it is a genus with a few very highly variable species. It is a wonderful taxonomic problem awaiting study utilising the latest DNA techniques. Is anyone is looking for a PhD topic? There are hundreds of specimens in Australian museums and it is not difficult to find these grasshoppers in the field. This nymph was found on the same shrub as the female above. It is assumed to be the same species, maybe even a brother os sister of the adult above. But it may be something different. 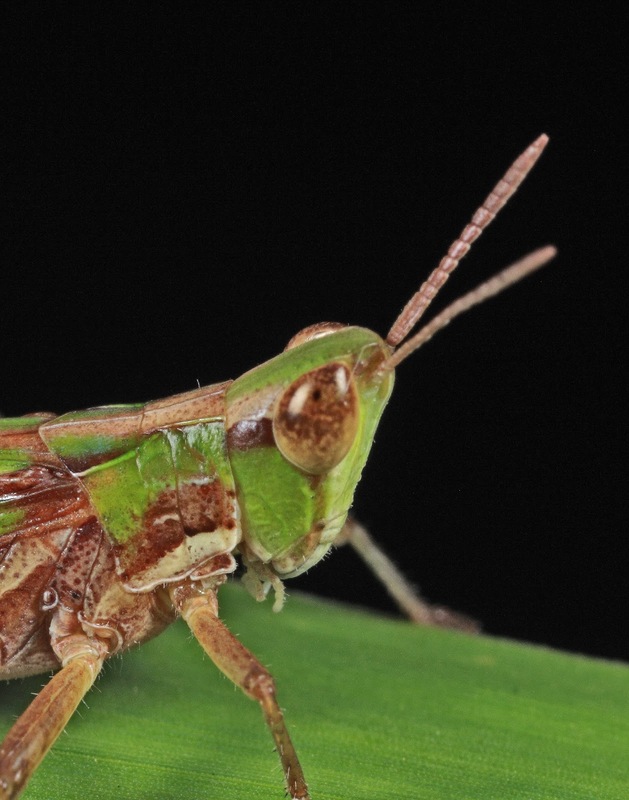 It shows some similarity to nymphs of Austracris proxima. The weather has cooled a bit, weather patterns are coming from the south and the days are shortening. All signs that autumn is in the air. Autumn is reflected in the appearance of certain insects. Giant mantids, Hierodula majuscula Tindale show up only at this time of year. They are commonly seen under the lights at p filling stations and on the roads at night. 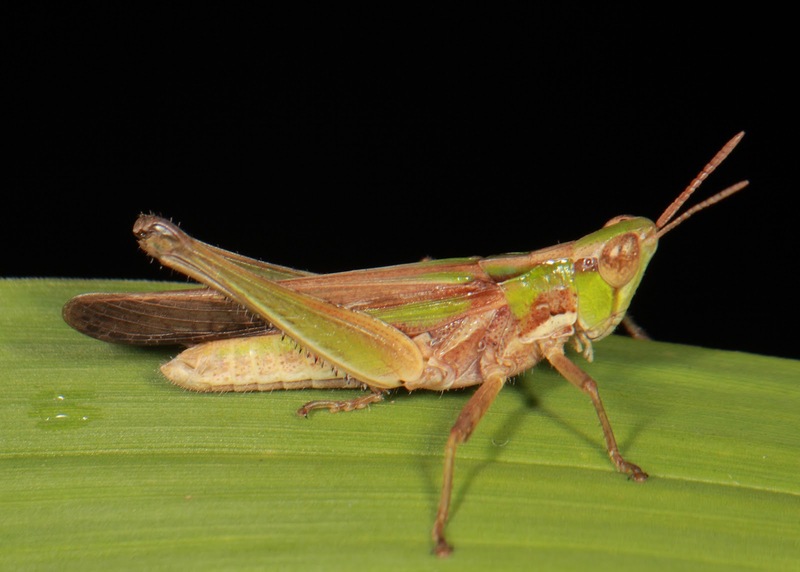 Hierodula is a large genus with many species in Asia and Malesia. These are large mantids measuring some 8 cm in body length. Most mantid species have distinctive colours and colour patterns on the insides of the forelegs. These patterns seem to be used in signaling amongst individuals of the same species. 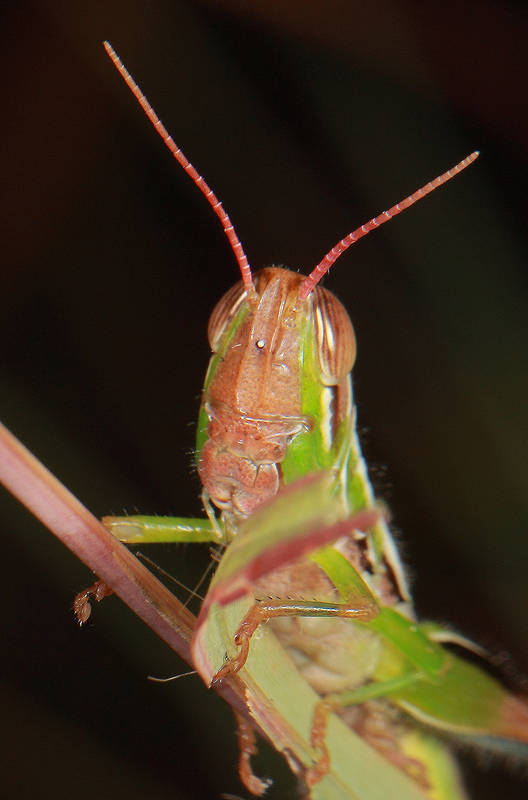 Many species, especially the smaller mantids, appear to be "boxing" when they do this signaling behaviour. In addition, the spines, their size and arrangement, are species specific and are useful in identifying species and establishing classifications. We have looked at sleeping bees before in this blog. Here we have examples of single sleeping bees of the family Apidae. This is the genus Amegilla. They were found in wet mixed woodland near Mt Molloy, Queensland. At sundown you can hear the buzzing of these bees as they examine suitable sites for the night's rest. Once they find a a grass stem that is acceptable, they grasp it with the mandibles and hold on until the morning sun gets them going. It appeared that two different species had the same behavioural habit at this locality. A blue-banded apid, Thyreus sp., was found sleeping on grass stems but it was much less common than the white and black banded species. As pointed out by Doug, this bee is a kleptoparasite of the Amegilla above. My friend Peter Shanahan asked to share some of his bird photos with the readers of this blog. All are copyright and Peter should be consulted if they are sought to be used elsewhere. A few are my own and I thought this the best place to display them. 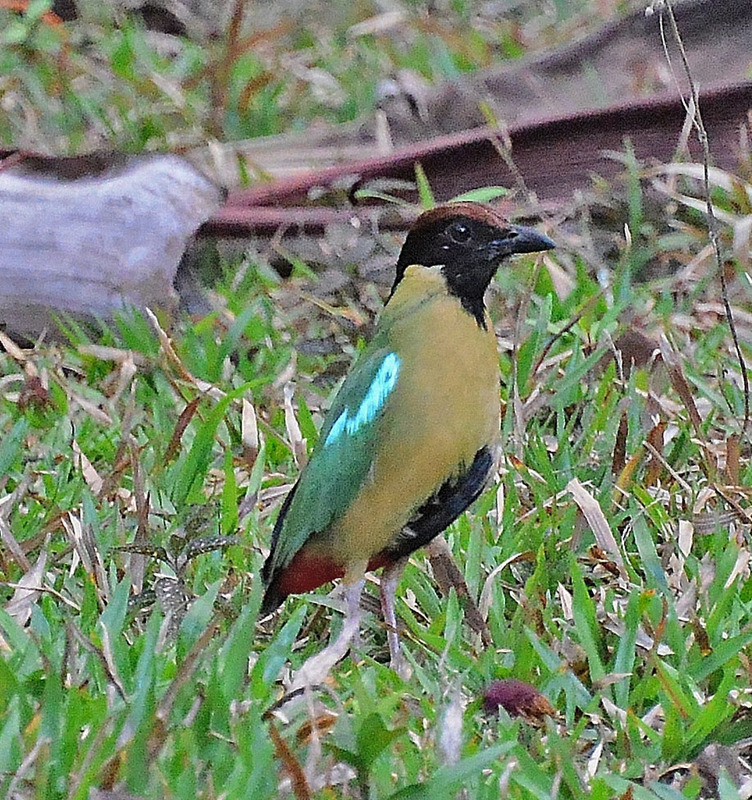 Most are common garden birds in north Queensland. Others can be found in open areas not far from the rainforest. 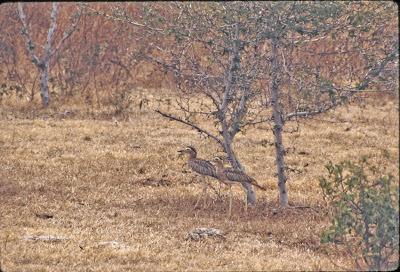 The Bush Thick-knee or Bush Stone-curlew, Burhinus gralliarus, a most beloved bird. 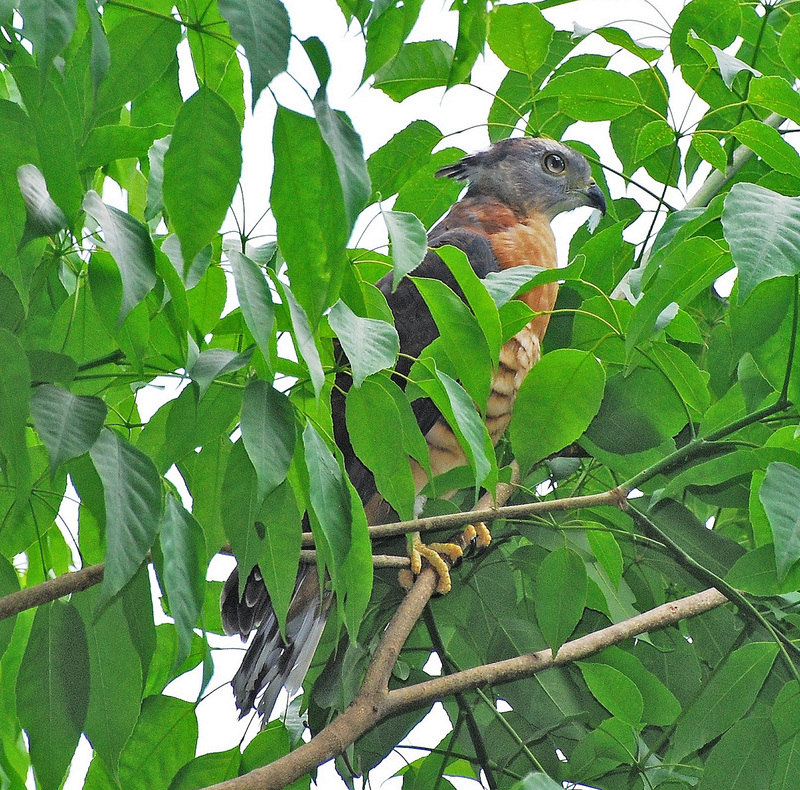 These birds can be found almost anywhere except in dense rainforests. 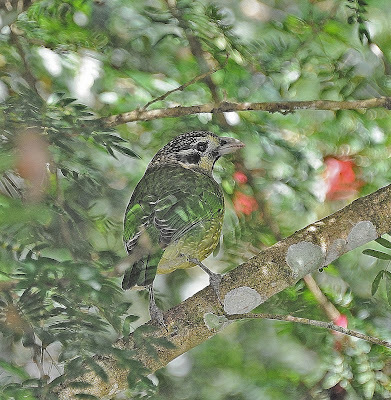 They do occupy cleared areas along rainforest margins. They are most active at night and their eerie calls are startling to the uninitiated. They feed on insects and small invertebrates but obviously not on Cane Toads. 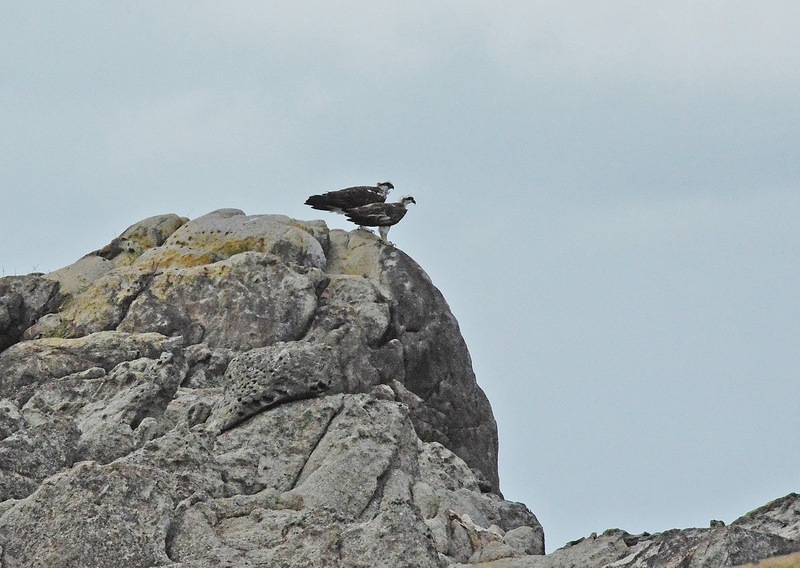 They often choose nest sites that are not conducive to the best end result. The often select parking lots, little-used roads and roadside verges to set up housekeeping. the nest is not much more than an gathering of a few twigs and leaves to form a cup. 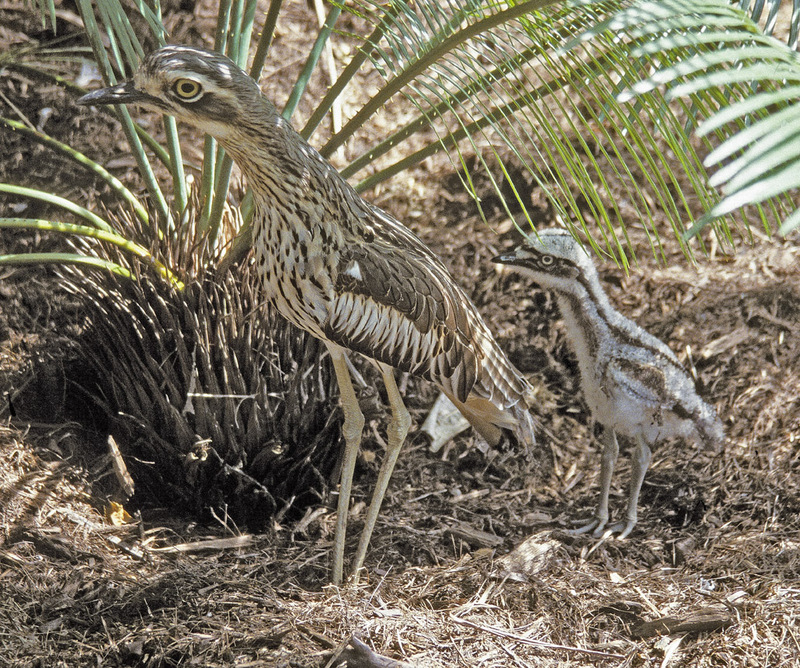 When the eggs hatch, the adults soon discover that they are not in the best place and carry on with the broken wing display and much hissing and and beak snapping. This is not a dead chick but one that is playing "possum". This was photographed on a hot day and it remained in this position for several minutes causing some concern about its vitality. But later it was seen strolling with its parents. 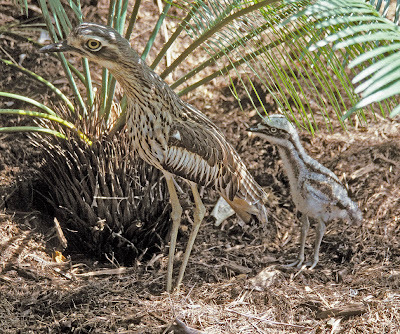 Double-striped Thick-knees, Burhinus bistriatus, in northern Costa Rica, 1972. The similarity in appearance and behaviur to the Australian species is striking. A gorgeous bird that is more often heard than seen. It seems to be a permanent resident in the rainforest. Another beauty. 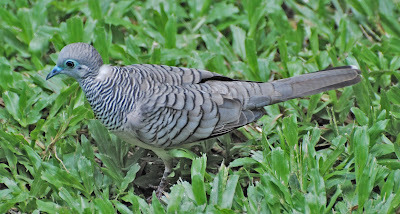 This bird is at home on the ground as well as in the trees where it feeds on fruits. It is easily approached and must be the prey of snakes, goannas and hawks. Most common in more open areas such as parks and large grassed areas. It is common and easily approached. 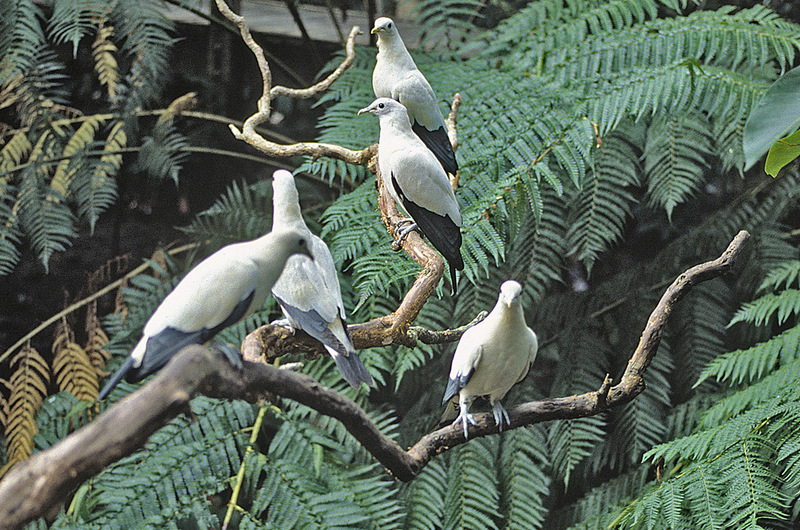 These large pigeons migrate between Australia and New Guinea each year. 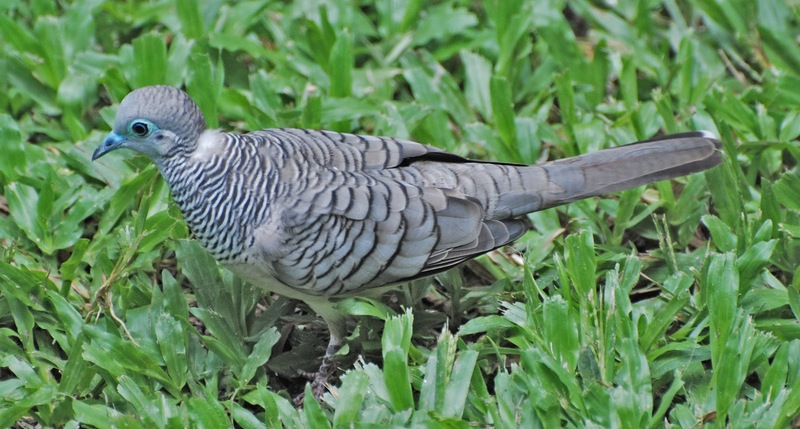 They are common in street trees in Cairns and other coastal cities but they do not ascend the mountains to Kuranda. 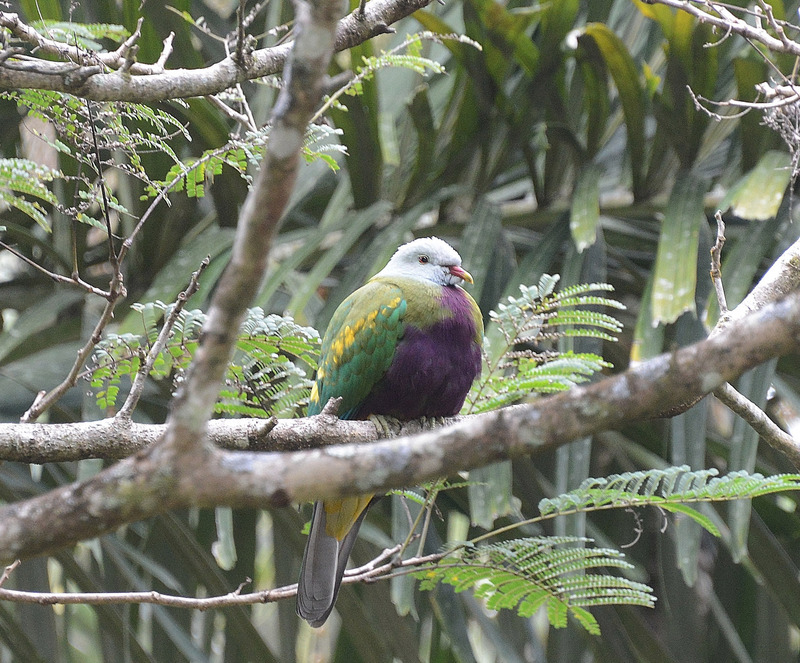 The Wompoo Fruit-dove is a very large bird that feeds on a varietu of tropical fruits and palm nuts. It is rather timid and is very difficult to approach. Peter was lucky to get this shot. The common catbird in our area. The calls of this bird, usually at dawn in the morning are not unlike those of a wayward cat. 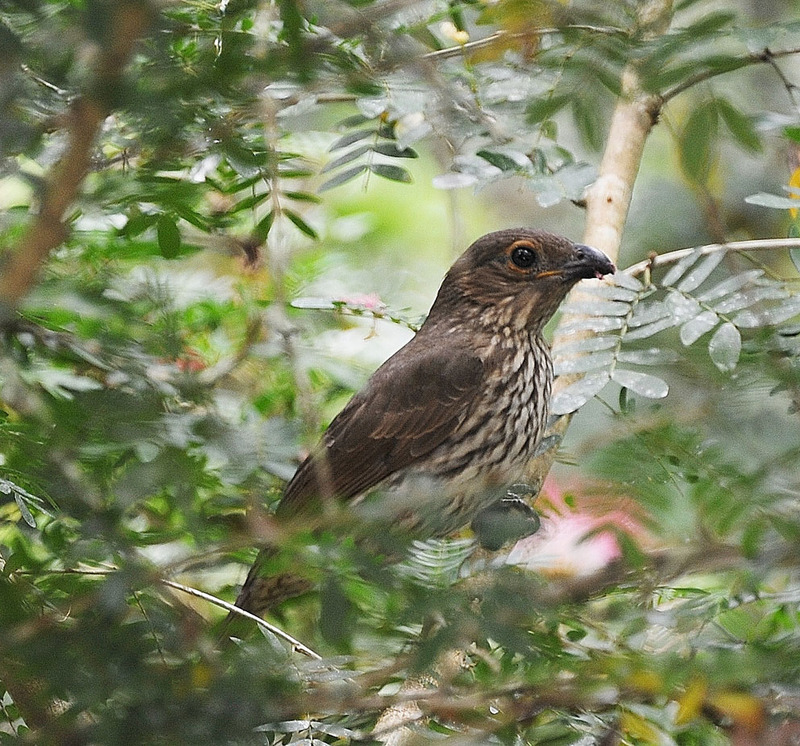 It is a bowerbird but does not build a bower. It is an insect eater and is maligned because of its tendency to raid bird nests. 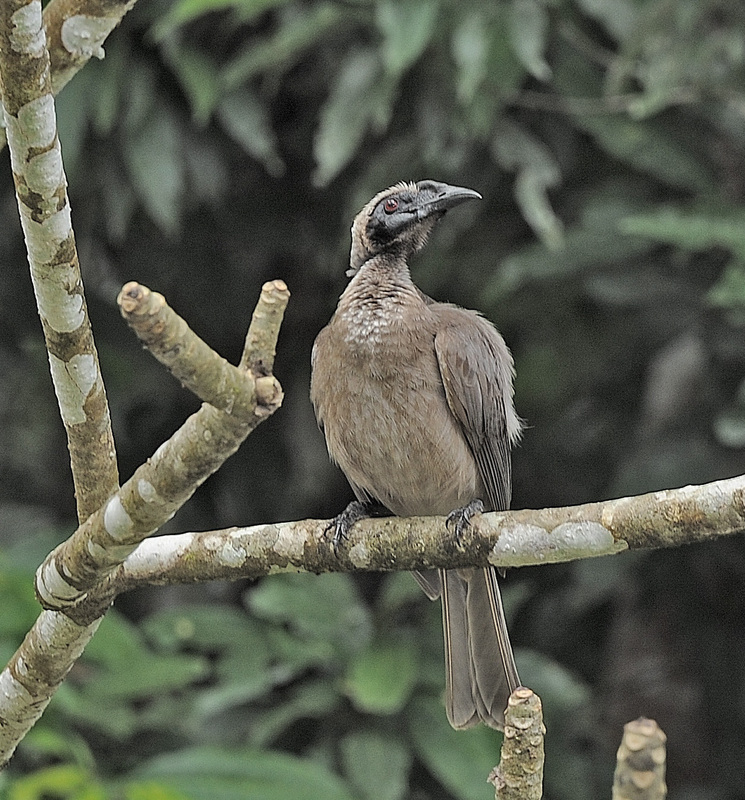 This is a different bird from the one above and is less often seen. It feeds on fruits and leaves of young trees. Males build a display court or stage that is decorated with leaves positioned with the undersides facing up. "Green" is the theme and leaves are replaced as they fade and age. 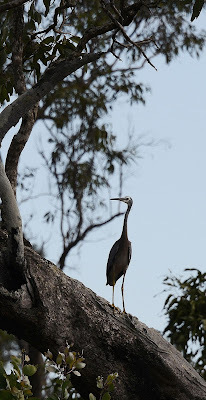 The stage is placed near a tree buttress or root where the male can perch and wait for females. 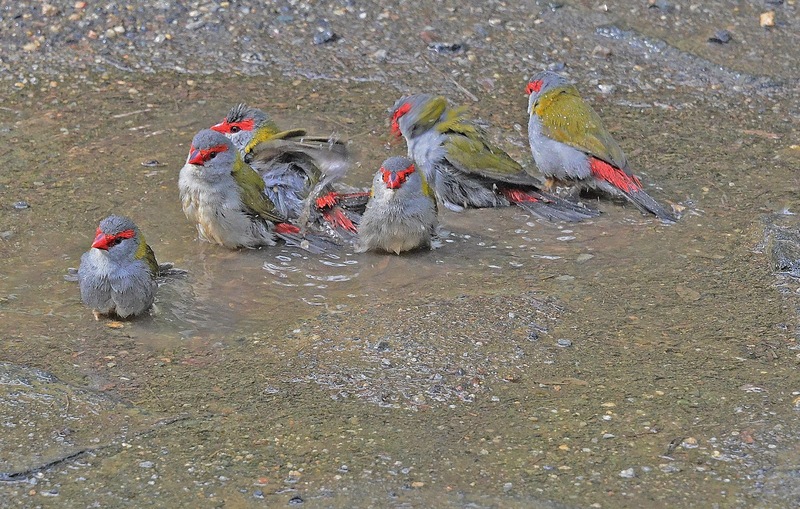 One attracted, the male bird goes through a series of dances that may eventually lead to a mating. 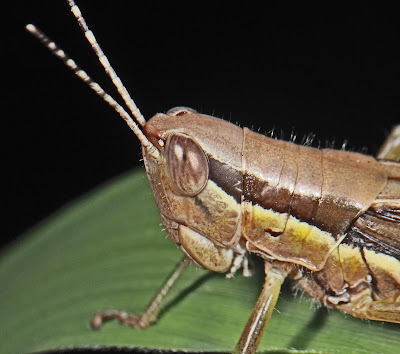 This is one of the few birds I know that seeks out stick insects (Phasmatodea) as a food source. It also eats frogs and lizards. (It is a bit disconcerting to hear the sorrowful (Buck) cries from the frog victims of the bird as it dismembers them alive. 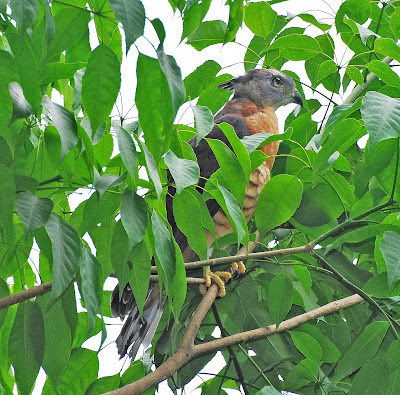 When it spots a prey from the air, the bird has a characteristic diving behaviour that you would think could not work in the forest canopy, but the bird usually emerges with its quarry. 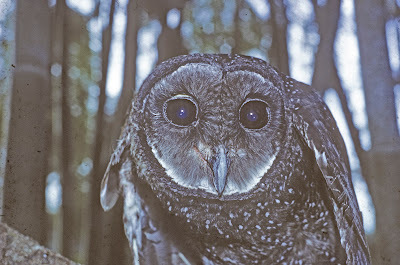 This is Australia's smallest and most widely distributed owl. 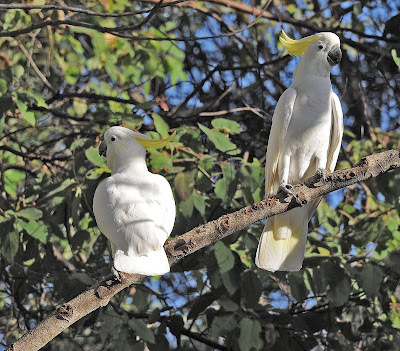 It is frequently heard at night in cities and we know of a residence in Canberra where one has returned to the same perhcing place year after year. This is a large, seldom-seen owl that feeds on possums, gliders, bandicoots, and birds to some extent. The call is an ear-piercing shriek. I wouldn't call Ospreys a garden bird but they are found along the Barron River where they successfully nest and fledge young. Surely the Jabiru is not a garden bird but they are seen in open cane fields near Cairns and Mareeba. They are not common but impressive when seen at close range. They feed on a variety of vertebrates and invertebrates. 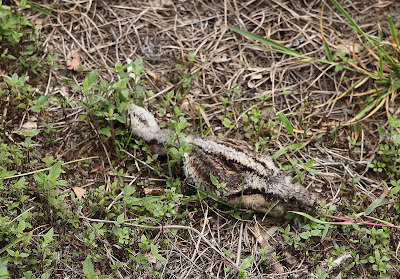 What happens when they encounter a cane toad? The Whiter-faced Heron is a garden bird depending upon the circumstances. If you have a fish pond, then surely you will have a visit, perhaps multiple visits. And the goldfish will disappear and those that escape the heron will probably be enjoyed by the Keel-backed Snake! 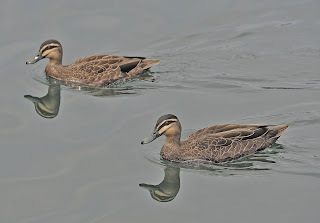 The Pacific Black Duck is the Australian equivalent of the Mallard. Steps have been taken to keep Mallards under control in Australia because they have the tendency to interbreed with others in the genus and produce hybrids. 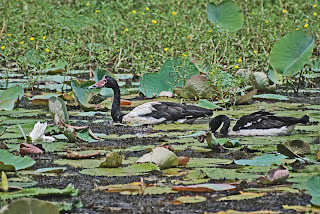 Black Ducks are common visitors to park ponds and garden ponds if out in the open and of large size. Flocks of Magpie Geese are being seen now in the open grasslands and lakes around Mareeba. 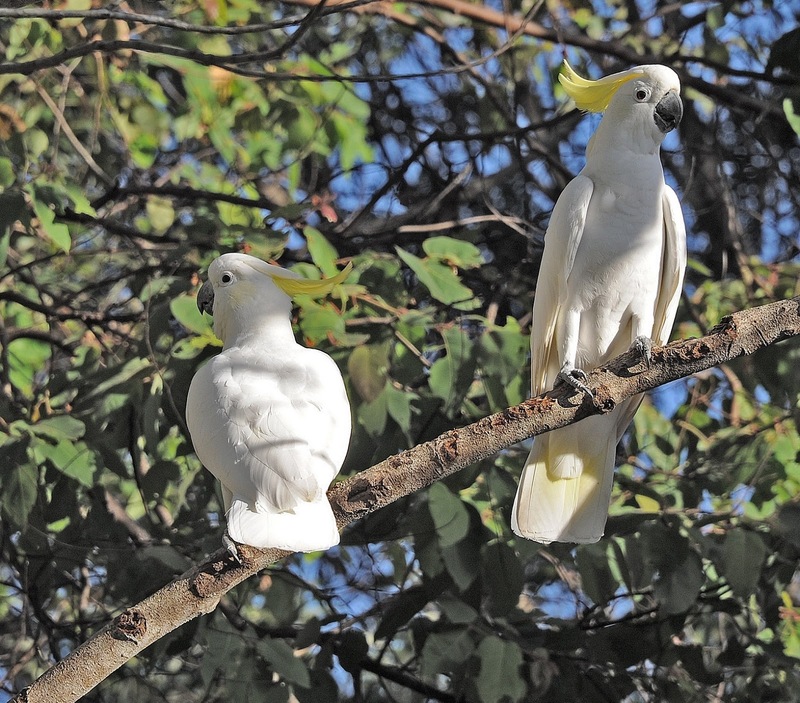 Why is black and white such a common theme amongst Australian birds? 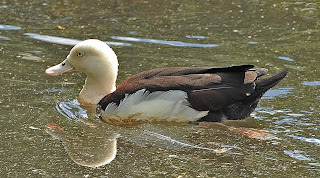 This is a coastal or Mangrove duck. 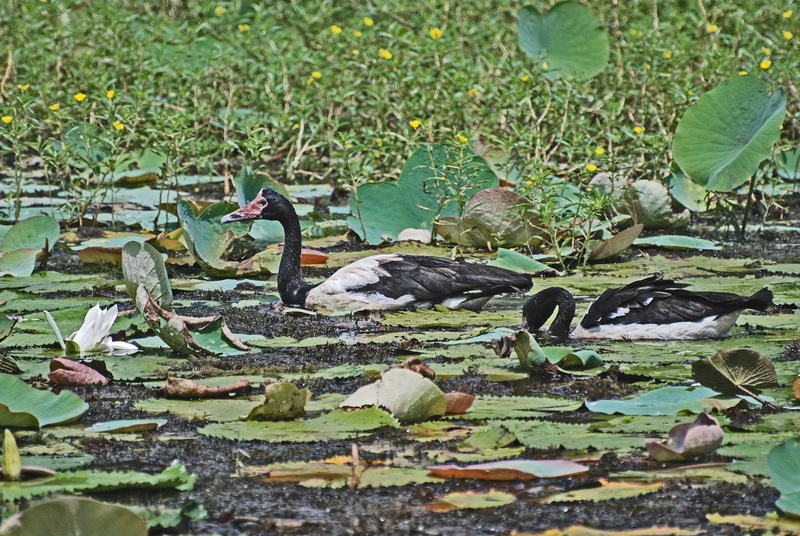 If you are lucky you can see them in the lakes of the Cairns Botanic Gardens adjacent to Greenslopes St. 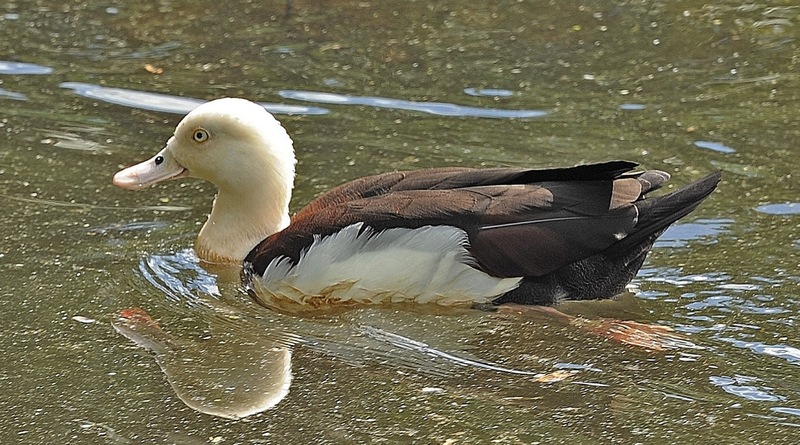 These ducks feed on crustaceans and plant material in their habitat. They nest in tree holes or hollows in branches. 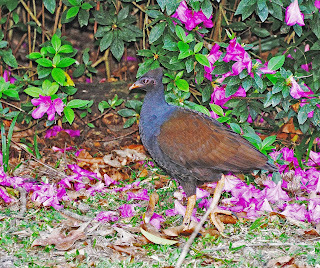 The mortal foe of every gardener is the Orange-footed Scrubfowl (along with the Brush Turkey). The raking habits of these birds and the persistence they display in getting their way, makes gardening a real challenge in the northern tropics. Placing chicken wire on the ground and covering with leaf litter can discourage their scraping. 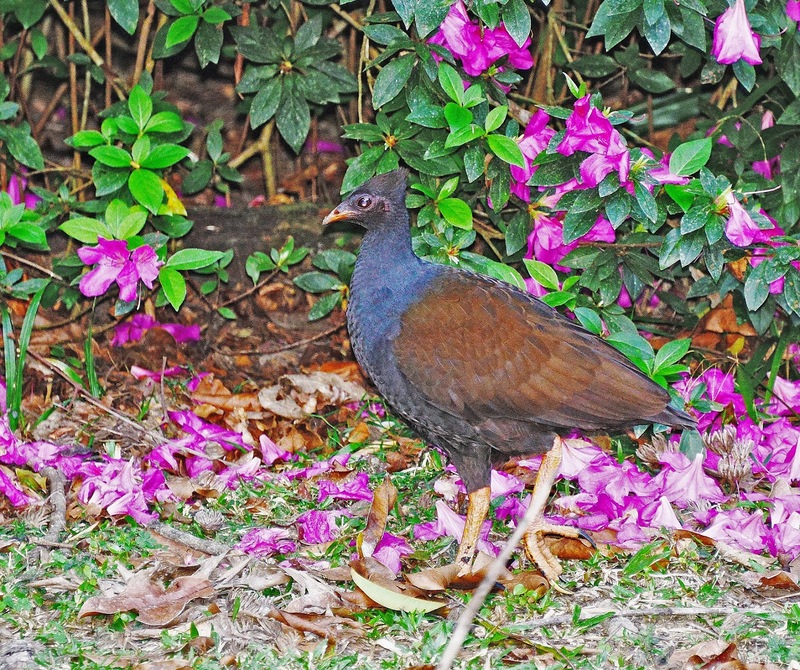 Scrub fowls are megapodes and build large mounds into which they lay their eggs. Some mounds can be many metres in height and length and are the efforts of birds over several generations. 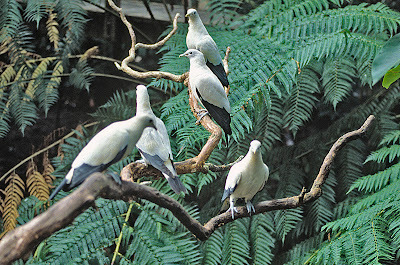 Coming from the southern temperate climes of Canberra, I had no idea that cockatoos would be so common in the rainforest. 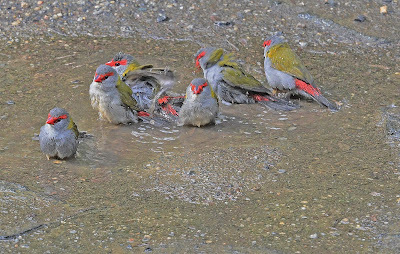 They are important feeders because the rubble they leave behind is eaten by a variety of other organisms. The "bully-boy" of the bird feeder. There is much beak-snapping when these birds show up at the feeder. They are Honeyeaters, albeit very large ones. They eat a lot of insects that they encounter when feeding on flowers. Scarabs seems to be a favourite food. 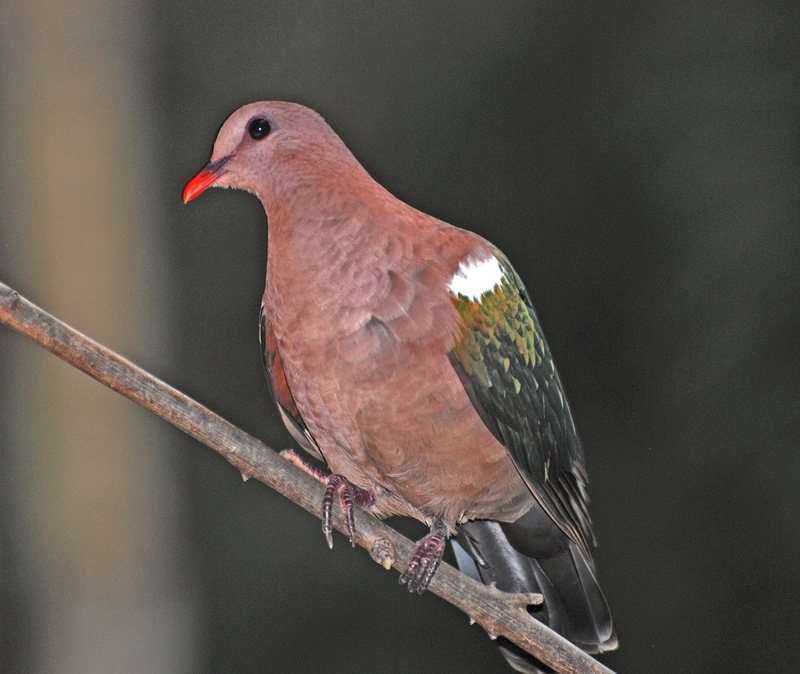 This bird is more often heard than seen. It is a rainforest birds and Peter was lucky to find one in the open when he had his camera available. Pittas feed on worms and insects they find on the rainforest floor in the leaf litter they seem to endlessly search. 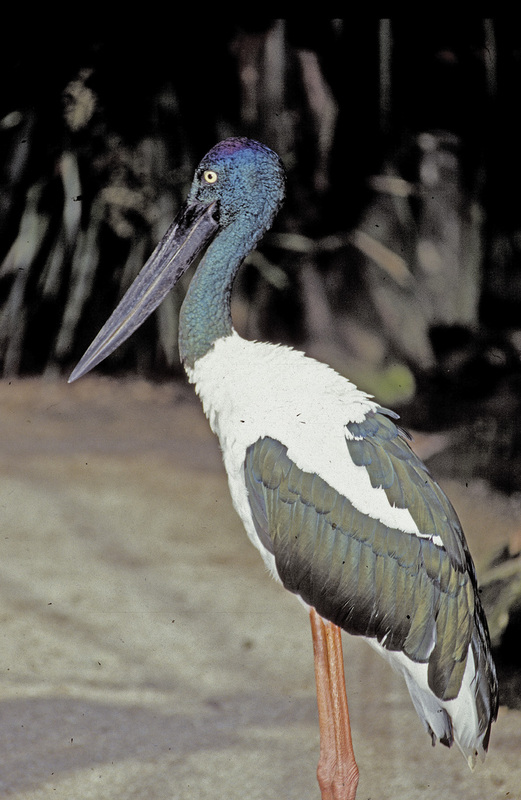 This species extends north to New Guinea and Indonesia. They use certain rocks as anvils to crack open snails. If lucky, you can find such a favoured rock and the shells of the snails scattered about. 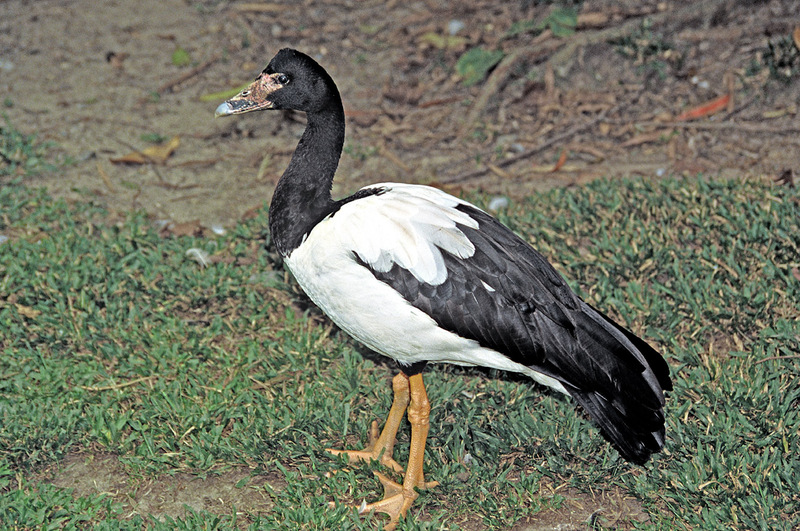 This is a seasonal bird that is often in small flocks. The birds are very vocal and the calls travel for a considerable distance. "Drongo" is an Aussie slang word for an idiot. This refers to the behaviour of the bird which is at best erratic. 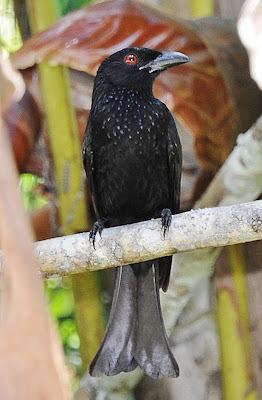 Drongos feed on insects, small birds and skinks. 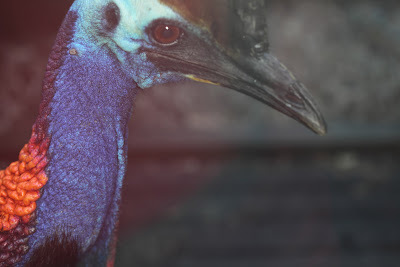 Cassowaries are garden birds in our neighbourhood.